One of the great difficulties facing Catholics today is to have an understanding of the faith that stretches beyond mere dogmatic formulations. Blessed John Paul II viewed this as one of the greatest challenges of his papacy. Whether it was his encyclicals, his speeches or his general audiences, the Pope tried to get Catholics to take a deeper look at the truth. Far from diminishing the importance of dogmatic statements, a deeper understanding is meant to make them more important in our lives. That is the challenge before us when we consider the sacraments. We understand the sacraments as “visible signs of an invisible reality.” While this is true, it really doesn’t tell us much about the sacraments. A visible sign of what? What is the reality? The questions (and answers!) contemporary Catholicism provides are clearly not satisfying. From a purely natural standpoint, a Biblical sign is meant to recall a past action. In the case of the Passover, the paschal memorial was meant to call to mind God’s deliverance of the Israelites from the cruel Egyptians. We do this sort of thing all the time. For sports athletes, trophies serve not only as a recognition of our triumphs, but they serve to recall those great moments where we excelled seemingly beyond ourselves to achieve that triumph. When a spouse looks at their wedding band, it is supposed to call to mind the commitment they made to their spouse that day at the altar. So far, so good. Contemporary Catholics accept and understand this aspect of the biblical sign. In the Bible, the act of remembrance also causes an action. In this case, the remembrance of the widows sins by Elijah’s presence caused the death of her son. The Prophet Ezekiel states that when the sins of Israel came to remembrance, they were taken into captivity. (Ezekial 21:24) Perhaps most famously, the priest at Mass says “Do this in remembrance of me” and the finished work of the Cross is applied to our lives. So for the Bible, signs convey a far deeper meaning than a mere remembrance of past events. The remembrance of past events causes a present reality. With this in mind, we can come to a certain understanding. The sacraments, first and foremost, are visible signs of communion with God. Since a sign is meant to recall something, I would submit that the sacrament recalls our original purpose in relation to God: that we were created for union with God. 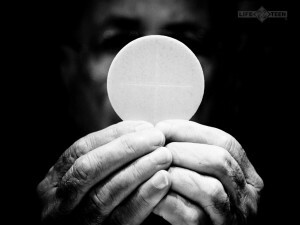 Every sacrament, in one way or another, points to this purpose. Like the “signs” of the Old Testament, the remebrance of this sign enhances that reality. So why was there a need for Christ to institute seven new sacraments? Many times we point to the fact that the sacraments of the new covenant confer grace, whereas the sacraments of the old covenant were “merely” signs. While grace is of supreme importance, there’s more to the story here. The sacraments of the New Covenant not only call us to our original purpose, they manifest a new reality. While we were created for union with God, what happens when we achieve such a union with God? The grace the sacraments contain transform us to a new reality. We are no longer living a life of anticipation of union with God like we did in the Old Covenant. The Sacraments don’t just transform our lives making that union possible (what Christ did on the Cross), they conform us to the state of life that is our destination: eternity in heaven. That is the power of the sacraments, and this truth should always be front and center in our lives.